I’m at the airport, waiting to get on a flight to NYC for The Diabetes Divide: Cities, Inequality, and the Spread of The Disease event hosted by The Atlantic and underwritten by Novo Nordisk US and thoughts about the upcoming discussions have actually prevented me from sleeping soundly. Why? Because we have a divide and the solution to close the gap isn’t simple. Diabetes is a serious public health challenge: 29 million Americans have diabetes, and 86 million more are pre-diabetic. Worse, the disease disproportionately strikes racial minorities, and trends show that diabetes prevalence is growing at an alarming rate in urban areas. How do socioeconomic, racial and geographic factors shape how the epidemic is being addressed in urban communities — and perceived by the general public? In a town hall event with community leaders, patients, public health experts and more, The Atlantic will consider the social determinants of diabetes, and what they require of the response. The “patients” on the discussion surrounding Citizens and Diabetes are Kelly Close of Close Concerns and diaTribe and me. We’ve been paired with a physician from Mount Sinai and the VP of Healthy Lifestyles, YMCA New York. The topic will be moderated and truth? I have no idea how the conversation will unfold. How do you change a society that values convenience? How do you entice someone making minimum wage to purchase “healthy” food choices when few restaurants and grocery stores offer them at a reasonable price? How do you test individuals for pre-diabetes when they can’t afford to go to a clinic? How do you explain to the healthcare system that simply telling an individual to lose weight and get some exercise is not going to change behaviors? How do you get someone to take time out of their lives to do diabetes education programs or diabetes prevention programs when they’re working two jobs to feed their family? How do you tell someone to walk a half-hour each day when there is no safe place for them to walk? How do you “market” diabetes in way that truly matters? How do you teach children that Type 2 diabetes does not have to be an inevitability in their lifetime when the latest statistics show that 1/3 of kids and adolescents are overweight or obese and they’re not getting enough physical activity? Cities Changing Diabetes is a project that was begun by NovoNordisk and other partners looking for solutions. They understand that it takes more than one organization to attack this issue, so they are working with healthcare, non-profits, and social services organizations to combat the rise. It’s also important to note that rural areas have their own issues. Another time, another event. My type of diabetes was not caused by race, weight, or sedentary lifestyle. (My beta cells left the pancreas party and never came back.) Type 2 diabetes is also not caused by race, weight, or sedentary lifestyle. How do we make a difference? Good question. I’m hoping for answers at this event and ways that I can help my diabetes community become healthier – and maybe prevent the community from growing larger. We’re a great group of people, but I’d like to keep it as exclusive as possible. The cost to enter this club is pretty expensive. I rode to McGill University on a wooly mammoth with my abacas strapped to my back. At least, it feels like I did when I talk with current college students. (I didn’t have a cell phone. FaceBook didn’t exist. You wanted to use the Internet? Go to the computer lab.) Yet, despite the years that will separate our convocation dates, we have the same university experiences: not enough sleep, too much to do, new challenges to face, and navigating towards an uncertain future. I didn’t hide my diabetes, but I certainly didn’t raise awareness, advocate for myself, or seek out other T1s to get support at McGill. I didn’t know a single person with diabetes the entire four years of my undergraduate degree. When I disclosed this to the team at the College Diabetes Network (CDN) last week, my heart ached a little. I needed that peer support back then, just as much as I do now. I’m thrilled that this organization exists and is creating programs so that support is always available for students (and parents and friends, too!). This week (November 9 – 13), I’m going back to college. Not on my wooly mammoth, but on the Internet, and I hope you join me on social media. As part of National Diabetes Awareness Month, CDN is hosting the 2nd annual College Diabetes Week. With over 30 campuses participating in the week’s events, we can join in on the fun (well, at least online)! What’s this about? Here is a blog by one of the CDN students about College Diabetes Week. Friends? Yes. Did they know I had diabetes? Only two of them. The others thought I really liked LifeSavers. If you could go back to university, what would you do differently to help educate, fundraise, raise awareness, and advocate? How would you celebrate life with diabetes as a student? What do you want current students to know? Share your thoughts, views, and ideas on Twitter, Facebook, and Instagram and help CDN make this an amazing #CollegeDiabetesWeek! #LaceUp4Diabetes – I'm Giving Away These Sweet Laces, Too! I need more exercise. O.K., I need to starting doing some exercise. Ironically, Novo Nordisk contacted me a few days after my doctor’s appointment and asked me if I would participate in their #LaceUp4Diabetes campaign to show how we can take steps to reduce the risk of diabetes (or in my case, reduce my laziness and my blood glucose levels at the same time!). Of course, I said: Shoelaces?! Count me in! Facebook the pic using the #LaceUp4Diabetes as a hashtag and upload it to ThePerfectD’s Facebook page: https://www.facebook.com/ThePerfectD What? You aren’t a fan of this page yet? All the cool kids are fans. Come jump off a bridge with us! Tweet the pic using the #LaceUp4Diabetes as a hostage and mentioning @theperfectdblog in the tweet. Don’t follow me yet? Follow me. I’ll lead you down the primrose path or the yellow brick road or the rabbit hole, but I promise it will be fun! I’ll select five lucky people based on creativity and ingenuity and the results from the swimsuit competition. I’ll announce the crazy people who participated and won on Tuesday, November 10th. #LaceUp4Diabetes – I’m Giving Away These Sweet Laces, Too!If you’re selected, I’ll ask for your email and mail address and I’ll ship these laces out to you ASAP so you can have them by November 14, 2015. You don’t have to have diabetes to participate. You just have to want to help take a single step towards diabetes awareness. Disclosure: Novo Nordisk sent me six pairs of shoelaces with no instructions. I’m doing this giveaway of my own free will and sending these to five people (because I kept a pair and laced them up on my sneaks…) of my own money (which I wish was free). They didn’t ask me to write about this. They didn’t ask me to share anything. We are a community. Sharing and helping and supporting is what we do. Take a step, take a photo, win shoelaces. Go! Over the weekend, I had the unmitigated pleasure of wandering through the de Young Museum in San Francisco. Most of my time spent in places of curated beauty is one of breathless anticipation, rounding corners to discover new pieces of art that stirs up emotions deserving to be felt in raw form. I have my favorite genres and periods and tend to gravitate towards those galleries, but sometimes, as I wander through a room on my way to get to what I want to see, I find what I need to see. 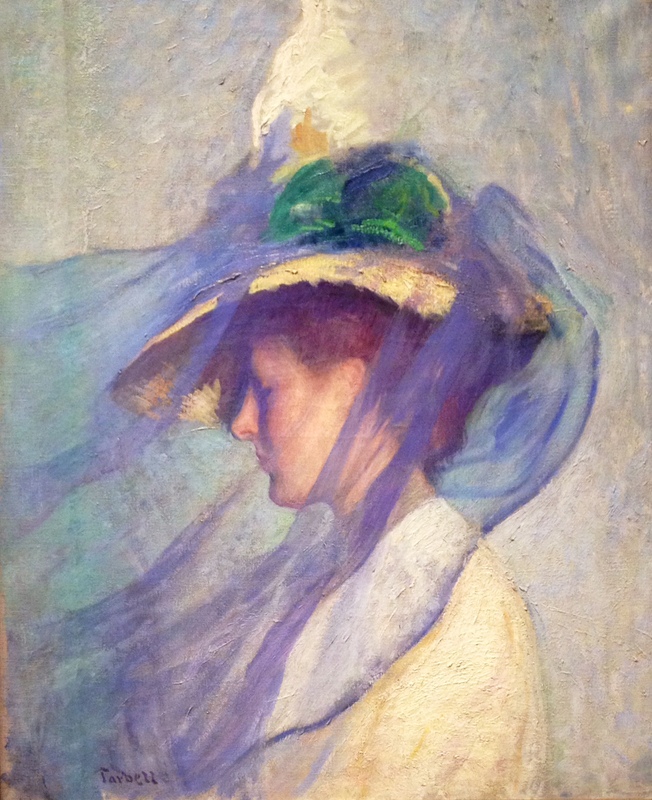 Edmund Charles Tarbell’s The Blue Veil. 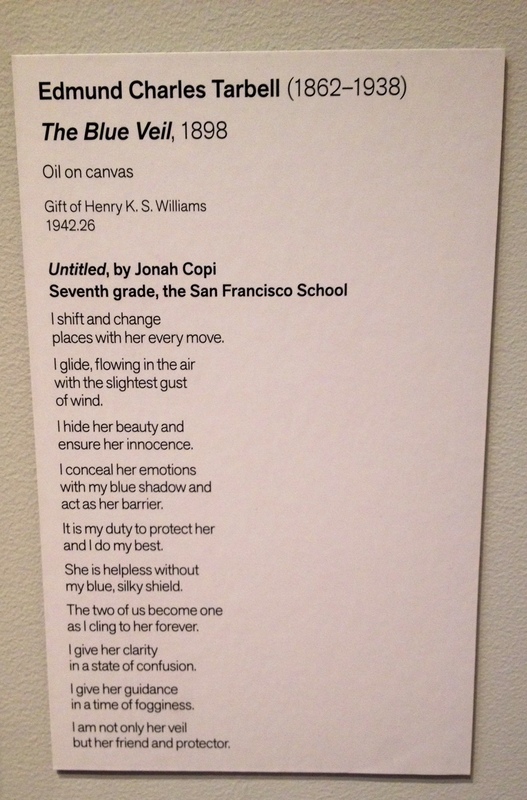 I have no idea who Jonah Copi is, but I’m grateful to him. My diabetes community is my blue veil. in a time of fogginess. Sometimes we forget that we have a blue veil when diabetes becomes overwhelming. And sometimes we lift that veil to allow others to step in underneath it to see our secrets and share in its comfort. But this is what I know: my world is colored with the beautiful blue that symbolizes my community and my friends. And I wear my blue veil proudly and hope that I can protect it as well as it has protected me. As November draws to a close and another “Diabetes Awareness Month” is on the books, the general public will go on to the next awareness campaign. I’m not angry or jealous, as we should all look to other communities with the same openness that we ask from them. I am just so very grateful that my blue veil will not disappear or leave me. It is always with me. Even in a museum tucked in a corner, waiting for me to find it.